​Manuscripts, oral history and pictures collections of the Mitchell Library, Sir William Dixson Library and Dixson Galleries. 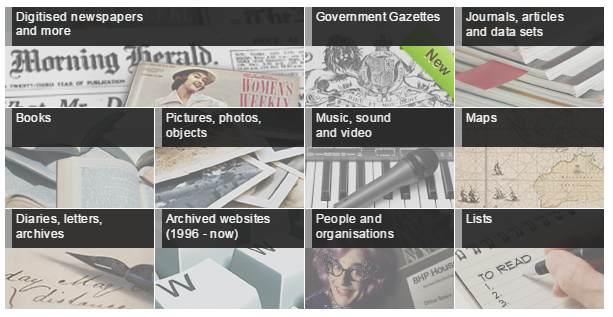 Trove is a fantastic comprehensive online resource by Australians, for Australians. It is an online gateway to resources from more than one thousand Australian libraries Museums and galleries. Trove helps you find and use resources relating to Australia. It's more than a search engine. Trove brings together content from libraries, museums, archives, repositories and other research and collecting organisations big and small. A list of contributors and partners whose collections are included in Trove can be viewed online. Trove is a platform on which new knowledge is being built. It is a collaboration between the National Library, Australia's State and Territory libraries and hundreds of cultural and research institutions around Australia, working together to create a legacy of Australia’s knowledge for now and into the future. Best of all, Trove is yours. As you text correct, comment, tag or contribute content you are helping to build a better service for everyone. Learn more about Trove in the Help Centre. Members of Aboriginal, Torres Strait Islander and Maori communities are advised that Trove contains names and images of deceased people.